Hello my name is Lilly Mae and I find myself in need of your kindness and generosity. I am just 5yrs old but in those 5 short years I have been shuffled from home to home. I am a good girl but sometimes life is just not fair, I want to find that forever home where my family will never give me up again. I have a problem that I hope you can see it in your heart to help me with here is my story. Awhile back my human was caring me outside to go potty when suddenly I was spooked and I leaped from his arms. 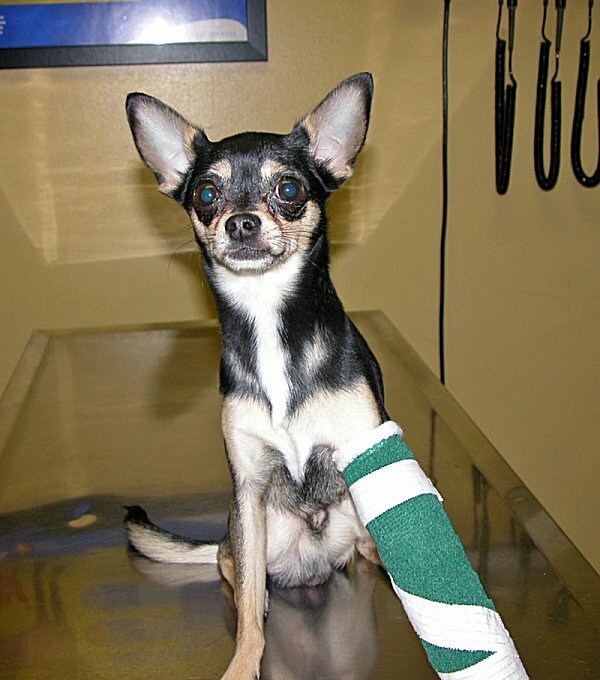 When I landed on the ground I broke my front leg, the break was very very severe for a little leg like mine.My family rushed me to the vet and after hours of surgery my leg was fixed or so we thought. My leg re broke but my family was unable to pay for the second surgery, the first had drained all of their savings. So the vet said the only course of action would be to remove my leg. My family said NO! They started searching for help and the only solution was to give me up to a rescue where my leg could be saved. My family made that hard decision to give me up and life now finds me in the care of a wonderful lady. Her name is Inge Irby she runs the Second Chance and Happy Tails Rescue in Tennessee. I am safe and loved here, it feels good but I am allot of pain from my broken leg. Ms Inge, is an true angel! She is working night and day trying to raise the funds to save my leg. She is doing all she can, but we are faltering in our efforts. She has found a wonderful vet to do my surgery, Dr. Sykes from Animal House on Dover Road, that is one item we can mark off our list of many. Dr. Sykes has given us a huge discount! My surgery will cost between $800-$900 that is a BIG drop from $1500.00 it would have cost normally. I appreciate Dr. Sykes's discount and Ms. Inge had to cashed in all of her saved up favors as well to help with the discount. Dr. Sykes will also spay me after he repairs my leg so I never have worry again. And here is where you come in! I would greatly appreciate any help you can give me and Ms. Inge, with your help we can save my leg. I hope you can find it in your hearts to help me. Please donate even if it is $1, that will help more than you can imagine. If you cannot donate please spread my story far and wide, send it in emails to your friends,or rescue contacts and post it on FaceBook. I know with yours, Inge and Dr. Sykes help I can have the life I have dreamed of, one where I have a healthy leg and an forever loving home. UPDATE: 9-13-2011 Lilly Mae had her surgery . She is doing great and is on the road to recovery, She is going through physical therapy and in about 6 week she will be ready for adoption. UPDATE: 11-18-2011 Lilly-Mae's fractured bone are not healing properly, ( She had several X-Ray done over the last weeks ) so the vet told us that her leg needs to be amputated. UPDATE: 11-23-2011. Lilly Mae had another surgery. Dr. Sykes amputated her leg today up to her shoulder.
" for Lilly Mae surgery" or use the chip in button below. 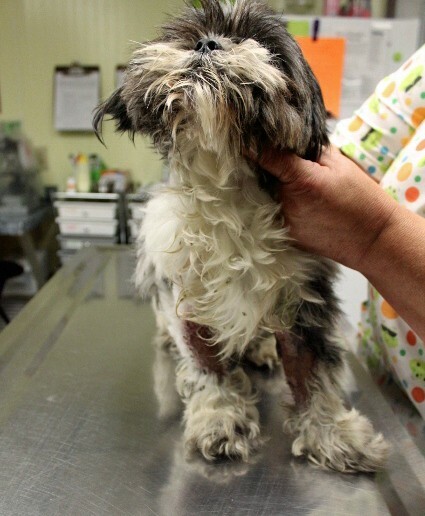 Angel the shih tzu was running for 1 week out at Ft. Campbell live fire range. Somebody abandoned him apparently hoping he would be killed.The security operator of the range finally caught him on Friday.about 9:30 in the evening. I got a call from Tony (the guy how caught him and took him home) He apologized for calling so late, but he could not remember my name or phone number. Angel he explained, was in pretty bade shape, would not eat or drink water and his body was full of burrs and hundreds of fleas and ticks.I told him to put flea and tick prevention on him and try to give him water with a syringe. I meet Tony the next day and took the dog with me. I gave him IV-Fluid, he was given a shot of Baytril and put him in a clean cage with food and water. The next morning we took him out and he started going to the bathroom and drinking a little bit of water. We're still cleaning his wounds and giving him antibiotic. The holes you see in his legs we suspect may be snake bites. By Tuesday we will shave him down so he will feel better and also cooler in this weather. Angel needs to go to the vet for his check up, a HW-Test and neuter. Update 6-7-11: Angel was to the vet on Tuesday and got meds for his eyes , he got ulcers in both eyes and with the meds we try to get them under control. Update 6-14-11: Angel had a recheck today and we did not got the good news we had hoped for. Angel had to stay with the vet and was undergoing surgery this afternoon on both of his eyes. Dr. Sykes will close up both of his eyes so the ulcer can heal ,but the prognosis is that he will be blind in one or both eyes most likely. Angel's entire vetbill will be close to about $ 600.00 to $ 700.00 Please open your heart and wallet to help us to pay his vetbill. Momma Mia came to us with a broken hip after being attacked by a dog. 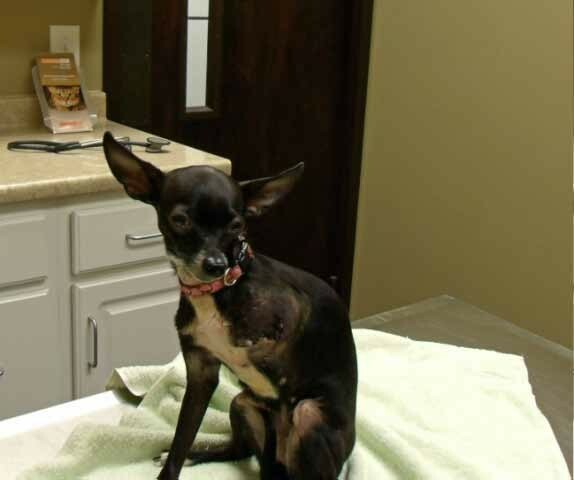 Her owner didn't have the money for the vet bill, so we paid the $550 to have the surgery. They agreed to pay us back, but never did. A few months later the owner abandoned Momma and her 4 puppies. While her puppies have found good homes, Momma is still up for adoption. Sgt Rogers (he was named after the officer who saved him from the needle) was found with a birth defect called "Hermaphrodite." Both male and female organs. He also had heartworms. His vet bill was over $1000. 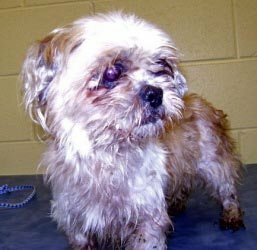 Destiny is a Brussels Griffon that was rescued after someone burned her back. This picture was taken after 6 weeks of intense cleaning and removal of dead skin. 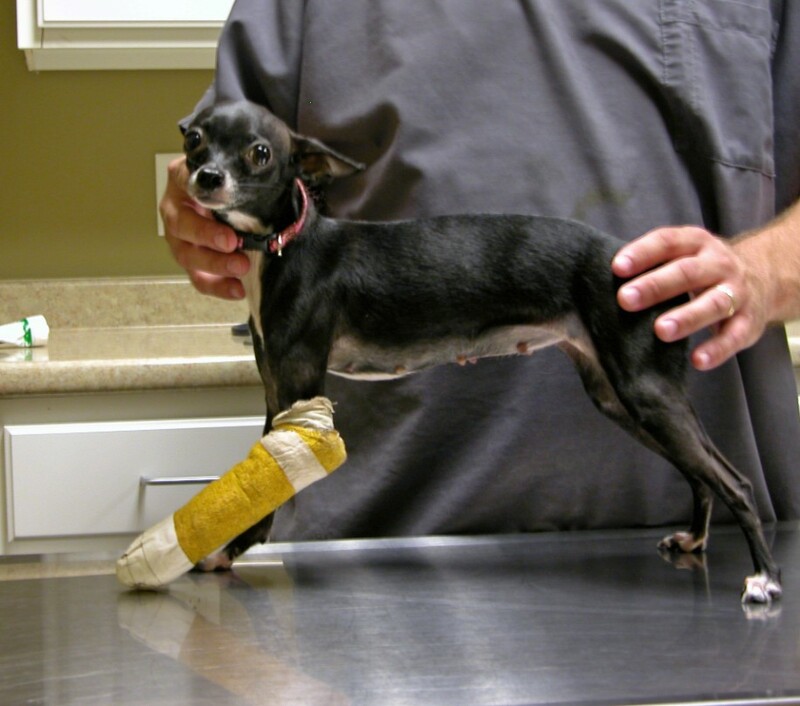 Trooper came to us with a broken leg after a storm. 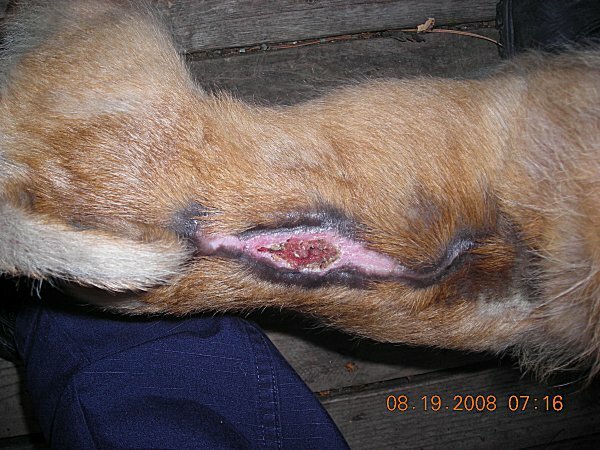 His owner never repaid the vet bill or boarding fee of over $2000. 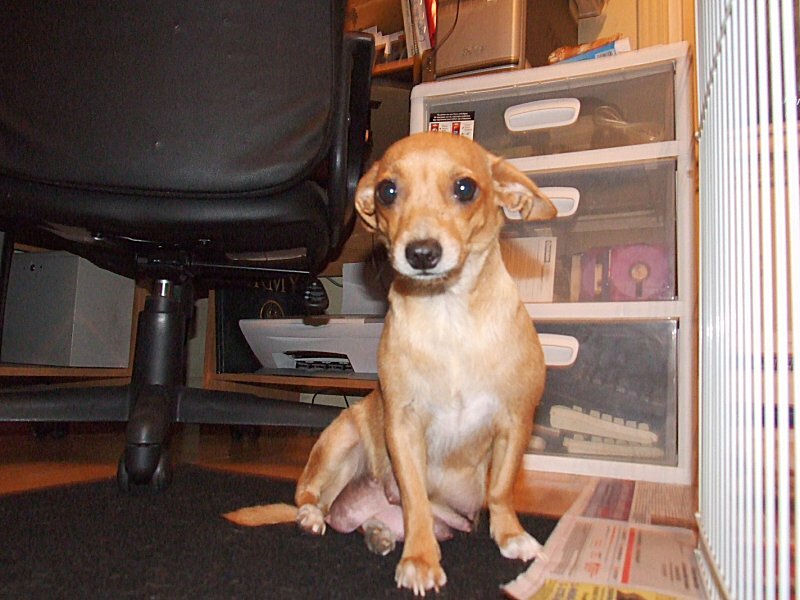 Honey was rescued from the local animal shelter. She is a senior with cataracts and is missing part of her ear. 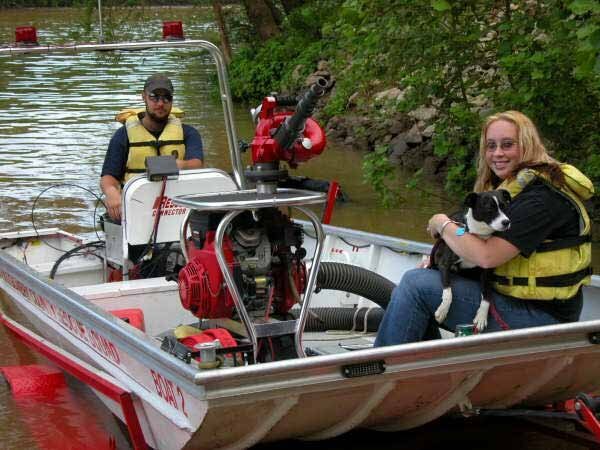 "On Saturday the 13 of June 09 we got a call from the 911 Dispatch-Center about a dog needing rescue.The dog was found tied to a rock near the river on the bluff of Mayhew Rd. Sheriff and the Montgomery County Rescue Squad where on site to help the poor little dog who was obviously scared and in danger of drowning. He got a ride back to the Montgomery County Rescue Station at "1 Providence Boulevard", where I picked him up. The dog was given the name " River" since this was where he was found. He is a very loving Little Boston Terrier Mix about 1 Yr. old. The following article is from the local paper under Crime Watch !!! "An abandoned dog left on the river bluff on Mayhew Road was rescued by emergency workers Saturday evening." 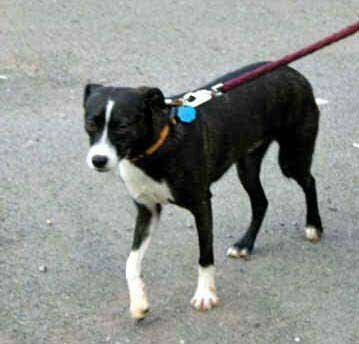 According to a Montgomery County incident report, a couple who was fishing found a dog tied to a rock in the 100 block of Mayhew Road. The couple untied the dog, which was too scared to leave. Second Chance and Happy Tails picked the dog up after its rescue..
UPDATE: Hello my name is Bogie and I came from West Memphis Tn Animal Shelter where my owner did not want me anymore. I was rescued by a wonderful rescue called Second Chance and Happy Tails. The owner of the rescue is named Inge. She took me to the vet where I was diagnosed with a heart condition and that was a death sentence. Inge took good care of me until I needed to be moved to a new foster home, because some mean men made running a rescue hard on Inge. So I was transferred to Boston Terrier Rescue of East TN, a foster home called The Sanctuary. I got to fly down on an airplane. Little did I know meeting the airport manager would lead to my new home, but I am getting ahead of myself. 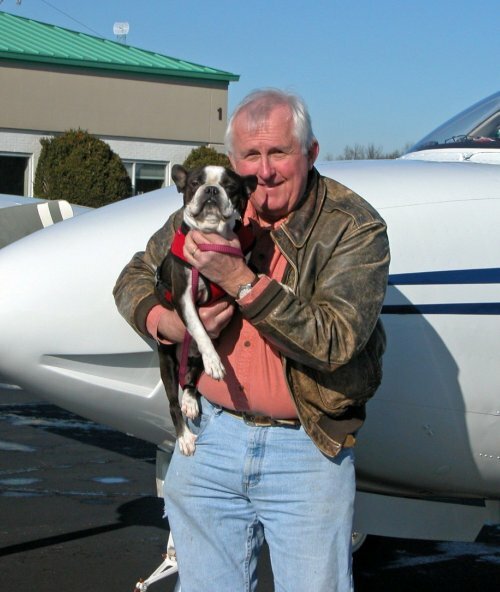 The nice pilot's name was Jim Carney, it was a blast flying. I met a nice man at the airport named Bob, when I got home Momma Marlana posted a picture of me on FaceBook where Bob's wife Saundra saw me. She and Momma Marlana started talking. She told Momma Marlana she would love to adopt me. Well Momma Marlana took me to the vet, a cool dude named Doc Tim. He told Momma my heart condition was a lot worse than was previously thought. He told me I maybe have only 1 year, but you never know the will of God. 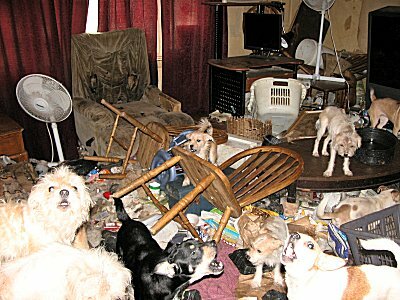 So I just thought I would live out my days here with the other dogs at The Sanctuary. Well little did I know someone loved me already, Ms Saundra. Well today Momma took me and my brothers on a car ride to see Ms Saundra and Mr. Bob!!! GUESS WHAT? I got to meet the entire family, and a cute girl Boston named Candy. Boy she is sweet. After meeting them I come to realize I love them, I want them to adopt me. I want to be a member of the Spera family. Well Ms. Saundra and Momma Marlana took me to the airport to see Mr. Bob. Well I love the airport, and going there sealed the deal. I've been adopted! I am going to my new home on Sunday!!!!!! I am now going to be called Bogie Spera and I will live in West Virginia and work at the Lonesome Pine Regional Airport. I am saved, I am adopted, I am loved.